This option allows Movienizer to download and save information about movie connections, but whether such information is really downloaded depends on the script you use. Some online movie databases do not provide the information, in which case nothing is downloaded. All movies in the list are represented as hyperlinks, you can click on each of them to check additional details. Movies from your collection have a special icon. If the required movie is not on the list, you can enter its title manually. To remove a movie connection, select a movie from the list and click the yellow minus button. The movie series connections ("Follows" and "Followed by") are not available on this tab. They are using the logic of the "Movie series" field that you see on the "General" tab of the "Edit info" window (the first screenshot in this article). To remove this sort of connections, you need to clear the "Movie series" field for the corresponding movies. To add such connection, open the page of the movie that you want to add and enter the correct "movie series" and "number in the series" values. 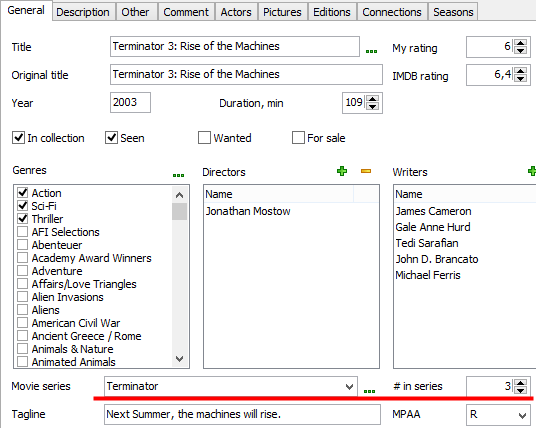 If the movie does not exist in your database, use the "Add movie" dialog to add it first. You do not need to download information about it or add it to your collection when creating such entry.